A missing tooth can be devastating. 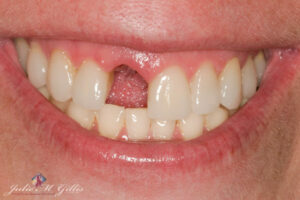 Luckily we can now treat situations like this with dental implants! 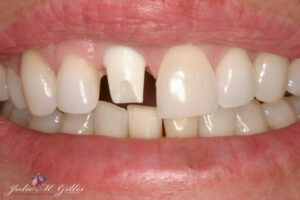 A missing front tooth restored with a dental implant, abutment and custom porcelain crown! Diane (not her real name) was devastated to lose her front tooth. She had always felt very confident about her smile and she was thrilled when we told her that we could replace her tooth with a dental implant. The treatment would take a while but her relief was evident when we told her that she would never have to go without a front tooth. Diane’s treatment started with a ‘Snap-on-Smile’ followed by a custom implant temporary crown until her implant could be placed and restored..
A custom dental implant abutment has been placed on top of the dental implant which acts as the crown of the tooth. A custom porcelain crown is then cemented or bonded to the implant abutment for a very natural looking result! Dental implants have been around for over 50 years when a bone study resulted in finding out that bone would form around a surgical titanium post so that the post could not be removed without taking bone as well. This is termed Osseo integration and the wonderful result is that we can place dental implants and then restore them to function and look like a patient has grown a new tooth. Our office uses dental implants to replace single or multiple teeth. We also use dental implants to help support and retain treatment partials and dentures. You can think of a dental implant as an artificial root. An implant is usually placed and allowed to heal before attachments are made that will pass through the tissue or gums and allow placement of a dental crown or tooth crown or bridge. Sometimes we can minimize the wait time and place a treatment restoration immediately so that you can have a good looking and comfortable temporary while the tissue around the implant is maturing. 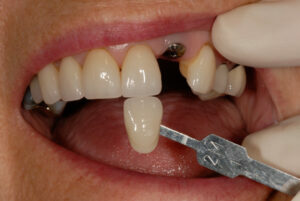 Once the dental implant crown is placed it should fit in naturally with the adjacent teeth. 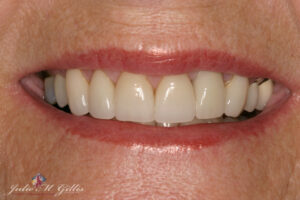 We take care to match the tooth or teeth to your existing teeth for a beautiful final result. Our office takes the time to make sure you understand the treatment and are involved in the treatment decisions. The shade of your new dental implant crown must be communicated to the dental laboratory. 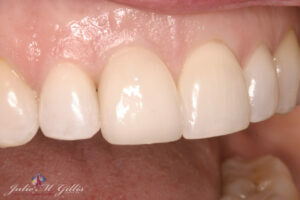 When you are a good candidate, Implants are wonderful replacements for back teeth as well! Our office would be happy to discuss with you treatment options to replace your missing teeth. Dental Implants and crowns may be a great option for you!